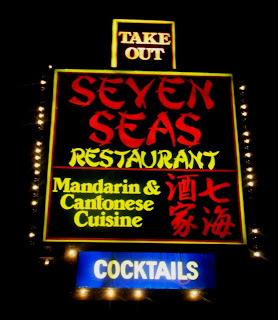 The lounge at the Seven Seas is a classic Chinese restaurant dive, which appears hastily assembled with various nostalgic Americana (in this case dominated by Marilyn Monroe) and drawing and odd variety of patrons. In fact, person-for-person, the light crowd in the lounge when I went may have been the most diverse set of drinkers I've ever seen; there were not more than ten people there the weeknight I dropped by, but the range included African American, Asian, Caucasian, Native American and wheelchair-bound. Debbie, the Native American representative -- a full-blooded Blackfoot, she informed me -- draws pictures as a way of getting to know people. She was chatting with me within three seconds of my entering, and had just finished a drawing of an albino giraffe on roller sakes. She asked me to name any animal. 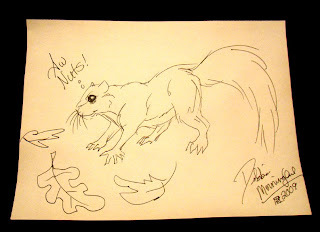 For some reason a squirrel came to mind (perhaps the recent Squirrels show at the Tractor? ), and in about 30 seconds one appeared.